Liahona is the name of the international magazines (ie non-English) that The Church of Jesus Christ of Latter-day Saints publishes. It derives its name from the Liahona mentioned in the Book of Mormon, a curious compass-like device which guided the Prophet Lehi and his family as they traveled in the wilderness toward their Promised Land. Unlike ordinary compasses, the Liahona was given by God and only worked according to a person's faith. No matter the language, the Liahona magazines are very similar, each page contains the same information except for the news section, which has localized information about events and people in the particular area. 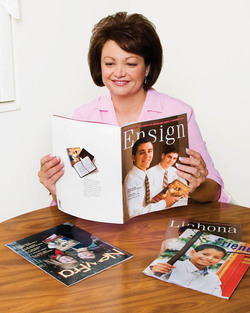 Many people think that the Liahona Magazines have the same information printed in them as the Ensign. This is not entirely true. Some of the same articles are printed, but the Liahona are not just translated versions of the Ensign. The Liahona also contains some of the information found in the New Era and the [[Friend Magazine|Friend (the magazines published for youth and children respectively). Currently the Church prints the Liahona for its members in 45 different languages. Not all of these international magazines are published monthly. Some are published once a month, others once a year. The frequency of printing the magazines is determined by Church leaders in Salt Lake City, with the help and advise of leaders from different areas. There is an exception, the message from the First Presidency and the Visiting Teaching messages are printed and distributed every month in 63 languages. The Church encourages as many members as are able to subscribe to one of the Liahona magazines, because they provide numerous benefits to members. The magazines are resources for personal study and for teaching Church principles within the home. The magazines also contain articles and activity ideas for the youth of the Church. Magazine articles can help members better fulfill their callings as home teachers, visiting teachers, in the Primary and when preparing for lessons or talks. The magazines also provide members with local and world-wide Church news. Subscriptions can be ordered online, by going to www.ldscatalog.com and then clicking on the title "Subscriptions, Renewals, and Gifts." Gift subscriptions are also be ordered. In some areas, magazines cannot be delivered directly to people’s homes. In these cases, the magazines are mailed to the ward or branch for distribution to its members. The Liahona is also available in PDF format on the Church's website www.lds.org . PDF versions only go back to about 2000. However, discussions are underway as to how to proceed to convert all previous issues back to 1970 to PDF format to complement the HTML versions which are already on the Church website. This page was last edited on 8 February 2011, at 20:44.